The first few tracks I heard from this album made it sound like a vanity project of sorts; songs Auerbach could have done with the Black Keys but decided to release as a solo effort. However, the more I listen to it, the less and less it sounds like that. These are songs that, while heavily influenced by distinct a blues and roots style, would not sound quite the same in the context of the Black Keys. Auerbach produced this record himself in his newly built home studio, and everything about it is tailored to his unique style. I hope Danger Mouse gives this a listen through, because he'll be flattered to hear how much Auerbach picked up from him after his production stint on Attack & Release. The title track uses a tinny electronic backing beat and heavily distorts Auerbach's vocals, while showcasing some great, bluesy guitar solos. There's even a fair amount of synths and full-sounding organs thrown into the mix on many of the tracks, and it all sounds just as great as it did on Attack & Release. One of my favorite moments on the record is "The Prowl" which is a growling blues number that finds Auerbach channeling a stalker-like persona through his lyrics. It's an edgier sound for him, but he pulls it off like it's second nature. Another high point is the soul-tinged "Whispered Words" which sounds like a cover of some obscure Motown tune, and even manages to match the sound of those recordings. Some of the most beautiful moments on the album find Auerbach trading his electric guitar for an acoustic, slowing things down a bit and doing some great ballads like "When the Night Comes" and "Goin' Home". This is a side of Auerbach that he really haven't heard up until now, and it ends up suiting him surprisingly well. 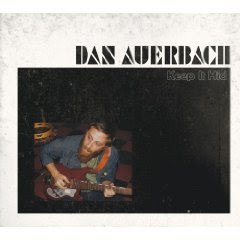 Keep It Hid reveals alot of new things about Auerbach and his music and does exactly what a solo album like this should do. It gives us a great mix of both the familiar and the new; showing us just how musically versatile this man can be. Black Keys fans, you'll get your fix, but this is a record that has an appeal beyond that audience which, in my mind, makes it a total success and one of my favorite records of the year so far.